Hugs and Handshakes, North Korea’s Smiling Kim Lightens Summit Mood – Coercion Code – "Dark Times are upon us"
SEOUL (Reuters) – The golden doors on the stately North Korean building swung open and leader Kim Jong Un, in a black Mao suit and surrounded by a gaggle of officials, descended steps towards the border. 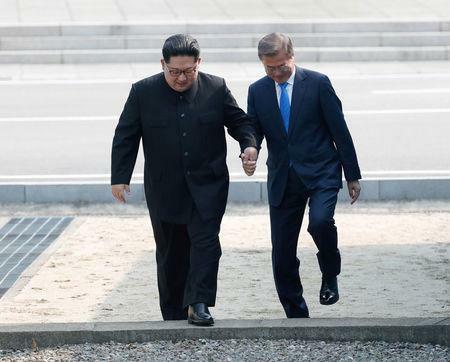 With a smile, Kim stretched out his hand toward a waiting, and smiling, South Korean President Moon Jae-in, who stood between the squat, blue buildings that straddle the border at Panmunjom. The village is one of the few places where there are no barbed wire fences or minefields between the two countries, separated by a conflict that ended with a truce, not a treaty, in 1953, meaning they are still technically at war. That’s something Kim’s grandfather, the North Korean regime’s founding leader Kim Il Sung, or his father, Kim Jong Il, never did. Two previous summits between leaders of the Koreas, in 2000 and 2007, were in Pyongyang, the North’s capital. The leaders of North and South Korea have signed a declaration agreeing to work for the “complete denuclearisation of the Korean Peninsula”. At their first summit in more than a decade, the two sides announced they would seek an agreement to establish “permanent” and “solid” peace on the peninsula. The declaration included promises to pursue military arms reduction, cease “hostile acts,” turn their fortified border into a “peace zone,” and seek multilateral talks with other countries such as the United States. “There will be no more war on the Korean Peninsula and we will be proclaiming the new era of peace is open,” South Korean President Moon Jae-in said. “We will establish peace on the Korean Peninsula and the international order will be changed by this agreement. Shaking hands again, Moon, 65, and Kim, 34, turned to face photographers in the North, and then the South, before Kim grabbed Moon’s hand and, in an unplanned move, invited him to step across the border into the North, where they stood face-to-face to talk a bit more. Kim said he felt a “swirl of emotion” as he walked the short distance to the border, wondering “why it took so long”, he told Moon later, at the beginning of their meeting. Later, as the afternoon sun set, the two men sat at a small table on a blue footbridge along the border for a half-hour private chat, at turns laughing and looking serious – an extraordinary scene given the tension just months ago, as a defiant North conducted missile and nuclear tests. Since January, relations have improved. Their Olympic teams march together under a common flag at February’s winter games in South Korea. As the two men started their meeting in the Peace House on the southern side of the border, both seemed aware of the gravity of the occasion. He said Kim’s crossing of the border had transformed Panmunjom into a “sign of peace, not a sign of division”. Kim responded with equal optimism. “With determination, we will be heading toward a better place to make up for the lost 11 years,” he said, referring to the last summit. Their two-hour morning meeting was marked with laughter and some banter, as well as more serious discussion, behind closed doors, officials said. At one point, Kim said he heard Moon was “always waking up early” because of North Korea’s missile tests – which usually occurred in the morning – and promised not to interrupt his sleep anymore, presidential spokesman Yoon Young-chan told reporters. Kim mentioned the contentious issue of North Korean defectors – who are routinely denounced in North Korean media as “human scum” – and even referred to the South Korean island of Yeonpyeong, which North Korean forces shelled in 2010, killing four people. “Coming here, I saw people are having high hopes for the summits – including … defectors and residents of Yeonpyeong Island – those who used to worry about North Korea’s missiles coming to them at any time,” Kim said, according to Yoon. Kim said he had heard good things about a South Korean high-speed train built for the Winter Olympics, and expressed concern that North Korea’s traffic system would “cause inconvenience” should Moon visit. The two men went back to their separate sides for lunch, Kim driven in a black limousine and escorted by a dozen bodyguards in dark suits and ties jogging alongside the vehicle. In the afternoon, they planted a memorial tree and watered it with water from rivers in the South and North, before walking into a small glen along the border and across the blue footbridge for their private tete-a-tete.